GrabHitch, a part of your everyday routine. Meet Jamie : a 25 year old fresh graduate who works in the central business district (CBD) of Singapore. Her week is pretty routine – working hours are Mondays to Fridays from 9am to 6pm and getting to work daily takes about 20 minutes. Booking a GrabHitch ride everyday helps take away the pain of dealing with morning traffic conditions and also ensures that she gets to work on time. What’s more, she gets to meet someone new everyday! GrabHitch is a social carpooling service that allows non-commercial everyday drivers to ‘tumpang’ other fellow riders who are going the same way. Whether you are driving or need a ride to your destination, carpooling with GrabHitch allows you to recover some petrol costs and save on travelling while making a friend or two – all from the convenience of your mobile phone! As a Hitch Rider, pre-book your ride and carpool with someone who lives or works around you! Save on travelling costs, no surge pricing or additional fees! Plan your transport options ahead of time just by creating your ride routes in our platform! Get to meet people from all walks of life, and you may even bump into your childhood friend or future boss. Network while travelling to and from your destination, you never know who you might meet. Did you know that 76% of Hitch Drivers are PMETs? Join our Hitch Driver Community! Bookings have to be made for GrabHitch rides between 16th March 2017 00:00 hours to 31st March 2017 23:59 hours to be eligible for the promotion. This promotion with promo code “MOVIE50” is only valid for the first 1,000 redemptions per calendar day. This incentive is only eligible for new drivers who sign up and successfully complete 1 Hitch ride as a driver between 16th March 2017 @ 00:00 hours – 31st March 2017 @ 23:59 hours. 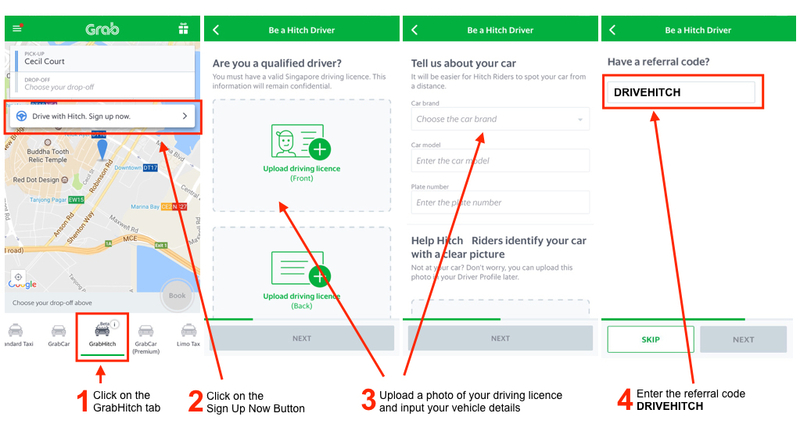 New drivers must sign up with the referral code DRIVEHITCH in order to qualify for the $20 credit incentive. The processing of the $20 credit incentive will only be conducted after the incentive period has ended (post-31st March 2017).